It turns out to be rather simple to analyse entrainer effects in scCO2 via a straightforward set of calculations. 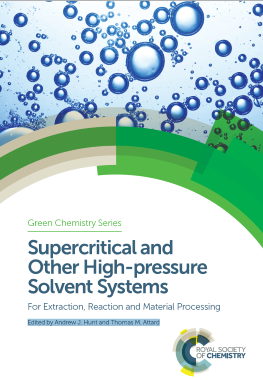 The background and full theory are described in the chapter by Abbott and Shimizu, "Understanding entrainer effects in scCO2", in Supercritical and Other High-pressure Solvent Systems, For Extraction, Reaction and Material Processing, Edited by Andrew J. Hunt and Thomas M. Attard, Royal Society of Chemistry Green Chemistry Series, August 2018. The scCO2 app provides a full analysis of detailed entrainer effect datasets in order to derive as many parameters as possible from the data. Here we are using the bare minimum of data and some simplifying assumptions which turn out to be surprisingly good at providing key insights into scCO2 entrainers. 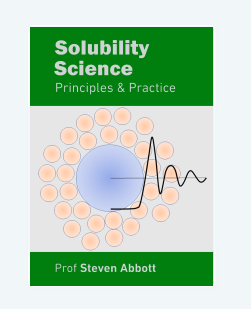 The starting point is the Chrastil formula for the basic solubility, S, of a solute in scCO2. It depends on the density, ρ, of the scCO2, the temperature, T and three parameters, K, A and B via. As the book has not yet been published, it's not appropriate to discuss the significance of using kav. For the moment, note that it allows us to provide an objective measure of the efficacy of entrainers, unlike the f values which are concentration specific. From an anlysis of kav values it is possible to create a unified explanation of entrainer effects and this will be discussed here once the book is published. Below the graphs you get the chance to implement a full Chrastil and Sovová simulation so you can compare the approximate value with any experimental data you have available. This is a rather powerful modelling tool of general interest. Experimentally, n is somewhere between 0.5 and 1 but for simplicity, the app assumes that n=1.